Denna vackra lägenhet med pool ligger bara några minuters promenad (300 meter) från hamnen i Cala d'Or med flera på trevliga restauranger, butiker och en stormarknad. Njut av din middag med en fantastisk utsikt över Medelhavet! Lägenheten var nyinredda 2015. Lägenheten består av ett vardagsrum och separat sovrum. I vardagsrummet finns en bekväm soffa, fåtölj och en trevlig matbord med fyra stolar. I vardagsrummet hittar du användbar ett modernt kök med en induktionshäll, kylskåp, brödrost, vattenkokare och Nespresso-maskin. Att resa med ett litet barn (<3 år)? En barnstol, bestick för barn och en barnsäng finns. Naturligtvis, har lägenheten luftkonditionering för både kylning (sommar) och uppvärmning (vintern). Det finns en tvättmaskin en ditt förfogande (gratis). Sovrummet har en fin, bekväm dubbelsäng och en garderob för dina kläder och resväskor. Det finns ook een babysäng (spjälsäng) och sängkläder. I badrummet hittar du en dusch / bad, toalett och handfat med en stor spegel. Balkongen har en härlig utsikt över trädgården med flera på blommor och palmer. På morgonen kan du njuta av din frukost alltid trevligt i morgonsolen. Du kan få färska croissanter, bröd och den typiska spanska delikatess 'ensaimadas' i snabbköpet i hamnen, ett par minuters promenad från lägenheten. Lägenheten har en rymlig gemensam trädgård med en pool. Poolen ger ett separat område för små barn. Poolen och gemenskapens trädgård hålls i slutet av maj till september). WiFi finns i lägenheten (under sommarsäsongen, juni - september) för en liten extra kostnad. Du kan begära en kod vid receptionen på det närliggande hotellet. Vill du ha gratis internetåtkomst? Bara några minuters promenad från lägenheten hittar du flera restauranger som erbjuder gratis WiFi och en fantastisk utsikt över fritidshamnen. Lägenheten ligger bredvid en vacker kommunal park, perfekt för en avkopplande promenad till hamnen eller stranden när som helst! Would have probably given 4.5 stars, but that's not possible...lovely apartment, clean, tidy and with most of the amenities you require. Some lovely restaurants nearby too. Churchill's probably the best but you need to book. Yacht Club do some excellent deals too. Slightly longer walk into town but worthwhile - town is a very friendly place. Apartment itself is spacious but make sure you get the anti-mosquito cream/candles/etc going early - we got attacked early on but after a few days it calmed down. Bed was comfortable but there were a couple of things I would recommend - a couple of more pillows would help if you want to sit up in bed and read (we're both big readers). Also, for slightly longer stays, a change of bedding being available would help. There was a washing machine in the apartment (very useful) and we did wash the bedding ourselves, but due to the weather on that day it only just dried in time! Kitchen is basic but has everything you need to keep yourself going. There is a TV but we didn't turn it on (we go on holiday to get away from that). The sofa was comfortable but could have done with being a little bigger (so we could have an afternoon siesta without going to bed)...these are all minor gripes though. WiFi available through the local hotel next door but signal was intermittent - we didn't worry about it as we like to turn off from the world as mentioned above! Loved the holiday, resort's clean/tidy/generally friendly and our choice of apartment was excellent. Rolf, the owner, was available and very helpful via WhatsApp/mobile so can thoroughly recommend this place. Lovely clean apartment in a great location! We stayed in this apartment for 5 nights in September 2018 with our 8 month old daughter. It was a fantastic apartment which met and exceeded all our needs. The kitchen was well equipped, the living area was spacious enough that our daughter could play and crawl, the balcony was wonderful - especially as it’s solid as opposed to railings therefore making it a safe place for a baby. Highchair and travelcot were lovely and clean too. 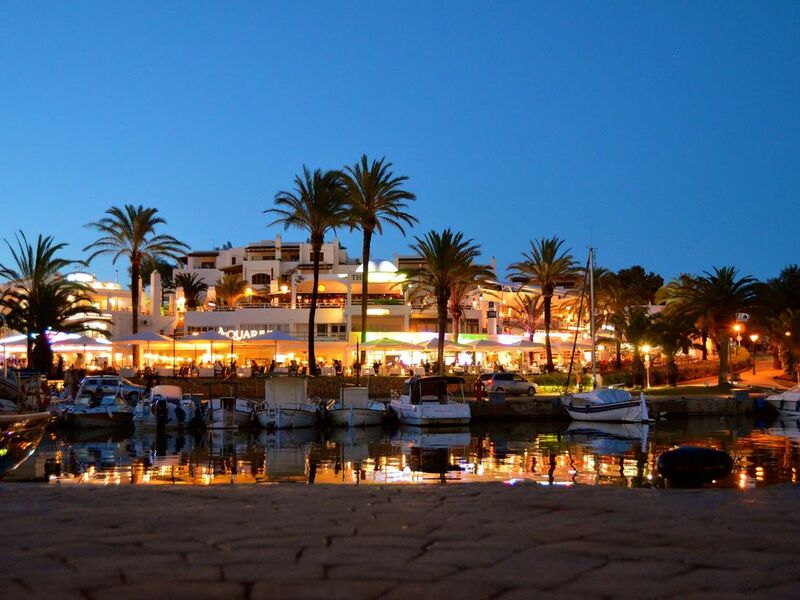 Cala d’or Marina is a 2 minute walk away, full of restaurants, bars, cafes etc - excellent for a late evening stroll admiring all the boats! Hi Laura, thanks a lot for your wonderful review. We very much appreciate you've taken the time to review the apartment. We're happy to hear you enjoyed your stay! And yes, if you would ever consider coming back to Cala d'Or for another holiday, don't hesitate to contact us again :) Many thanks for your stay! Siamo stati due settimane con un bimbo di un anno.casa bella e con tutti i comfort.proprietario gentilissimo è disponibile . Lovely spacious apartment in a beautiful place, perfect location for the marina. Apartment located a short walk from the beautiful marina on the 2nd floor of an apartment complex. It is set back a bit from a nearby hotel and there are no noisy bars/restaurants too close so it’s nice and quiet at nights. Lovely balcony overlooking some gardens which you can walk through to get to a pool. Pool is decent with a separate part and facilities for kids. Apartment has a decent sized living area/kitchen with all facilities we needed, including the much needed air conditioning! Bedroom had comfortable bed with decent storage space for clothes. Bathroom sufficient size with nice shower. Owners were excellent at communicating and very helpful, would definitely use again. Hi Paul and Dionne, thanks a lot for your wonderful review. Great to hear you had a nice time in the area and our apartment. If you would ever like to book again, you're very welcome of course.